WIth three Hobbit movies now planned, and one of them coming in December this year, it's fair to start wondering just how exactly director Peter Jackson plans to make a trilogy of out a single book, and one shorter than any of the three books in the Lord of the Rings trilogy, for which the Hobbit films will act as prequels. Obviously the world of Middle Earth is massive, and Jackson has explored it and defined it more than anyone besides J.R.R. Tolkien himself. But where do you get enough story for three movies? Well, you start expanding on what's there. And while there's been plenty of speculation about how Jackson might draw out the story, we've now got our first concrete evidence of how it will happen, with USA Today debuting a photo of the wizard Radagast the Brown. 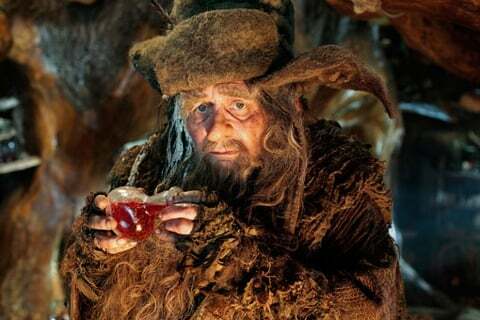 Played by Sylvester McCoy in the film, Radagast is only mentioned once in The Hobbit book, but he's got a much bigger role here. Take a look at him below. Radagast is only mentioned in passing in The Hobbit, with Gandalf describing him as his "cousin," but he plays a key role in the book The Fellowship of the Ring, helping the dark wizard Saruman lure Gandalf into the tower where he's imprisoned. Boyens is keeping mum about how exactly Radagast will fit into the narrative of The Hobbit, but given that we're seeing his photo now, we can probably count on him appearing in the first film, An Unexpected Journey, which is set for release December 14 this year. Click here to learn everything else you could possibly want to know about it. USA Today also debuted a handful of other photos from the film, though featuring characters we'd previously met. Click on the worried-looking Bilbo below to see their entire gallery!